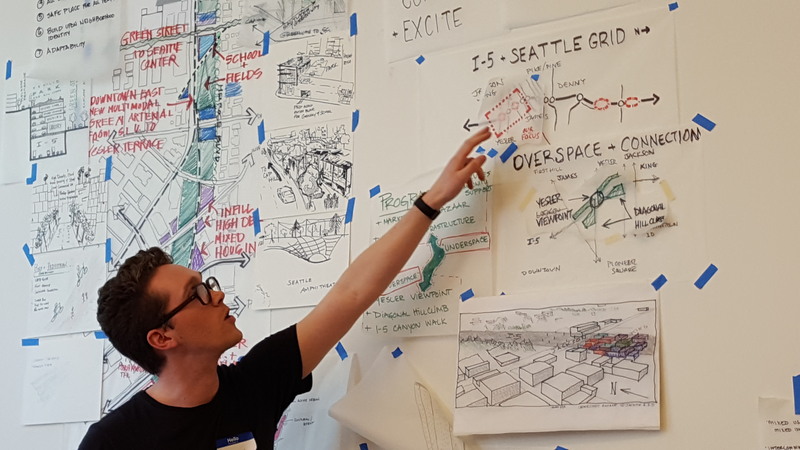 Last Saturday a diverse mix of Seattle residents, designers, and community leaders converged on the 12th Avenue Arts building to imagine lidding Interstate 5. 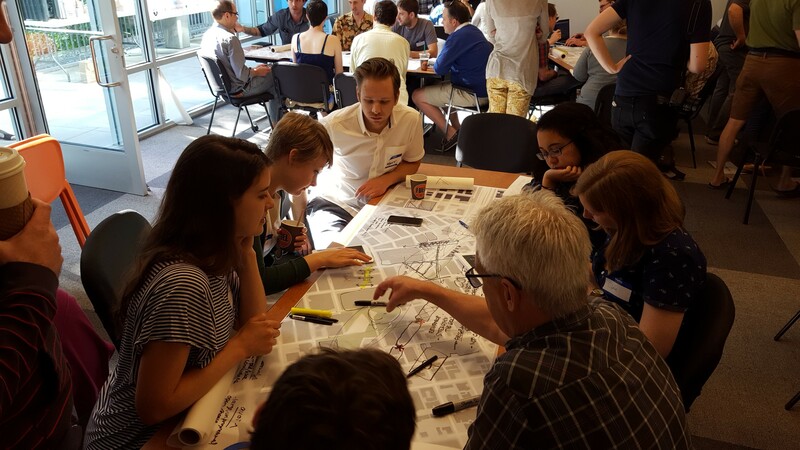 At least 75 people packed a conference room all morning and gathered around tables full of maps and trace paper to hash out ideas for how lids should be designed and integrated into the city’s existing urban fabric. Designs universally included park space, but there was also a strong showing of bike and pedestrian trails, housing, and even an elementary school. 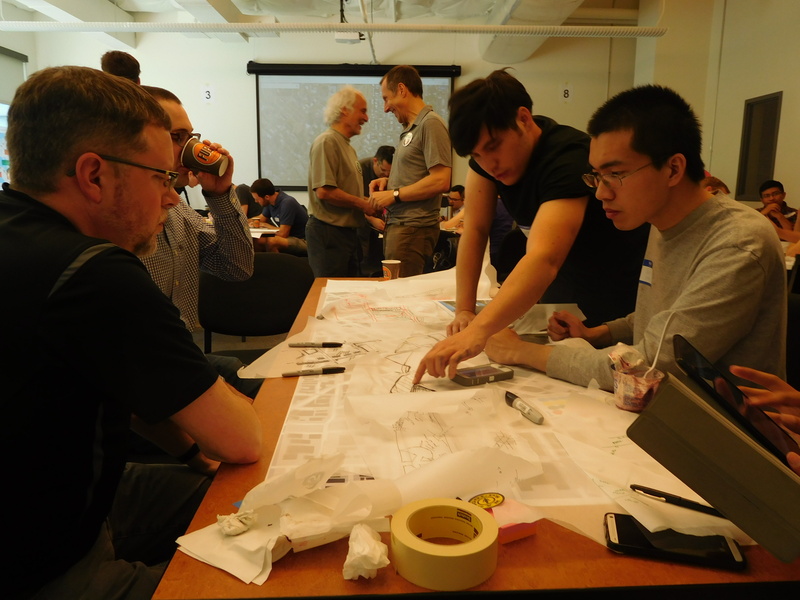 The charrette succeeded in kicking off a broader public conversation of lidding I-5 and building a grassroots movement to correct the mistakes of 20th century infrastructure. The crowd was surprisingly young, and as such the energy in the room was palpable. It didn’t take much prompting for the teams to get inspired and bolt out the gate with innovative ideas. 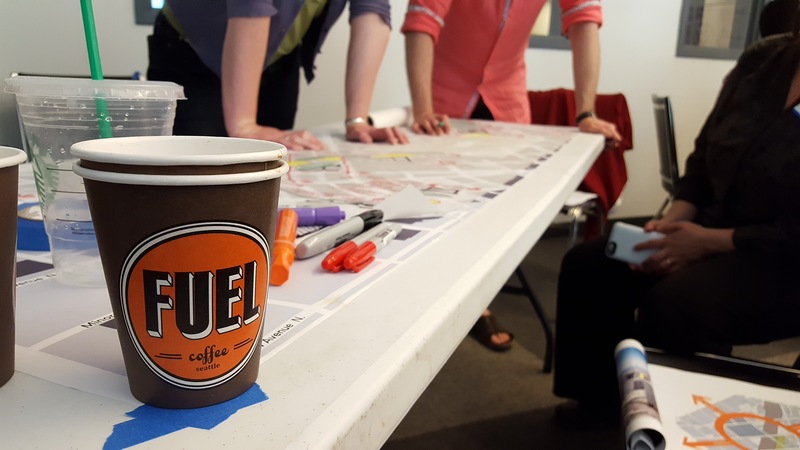 A brief introduction to the concept of freeway lids, along with pies and coffee, spurred early discussions on broad issues of public versus private uses, future parks programming, safety, and multi-modal infrastructure. Posters with case studies of other lid projects and a packet with technical information about Downtown Seattle were also provided. The focus area was in the Center City where I-5 runs in a trench, but teams were encouraged to consider other segments of the freeway and surrounding streets and neighborhoods. 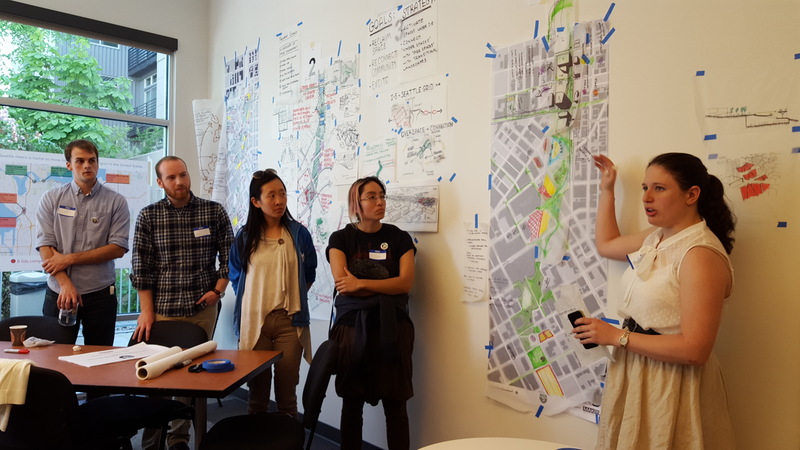 And indeed, a few teams extended their concepts southward to Yesler Terrace and even the International District, areas that have historically been home to immigrants, the poor, and other disadvantaged communities that could benefit from a more pleasant urban environment. Others extended north past Denny Way. But overall there appeared to be consensus for sealing off the sights and sounds of the freeway. Many of the teams highlighted possible nodes of foot traffic while others focused on broader activity zones. Housing and commercial space made frequent appearances, and ideas for parks ranged from quiet sanctuaries to more active features like ballfields. 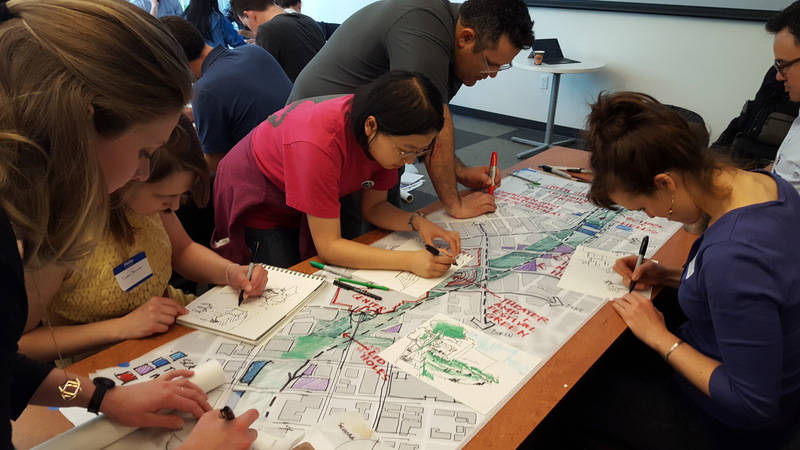 Some teams also examined how the angle of the city street grid intersects the freeway and whether new transportation connections should be made or if others could be closed to vehicle traffic. As the three hour work window closed, the eight teams scrambled to put the finishing touches on their drawings and taped them to the wall for brief presentations. Most opted to incorporate the long base map that was provided, and there were also a variety of small sketches and sections illustrating lid concepts. 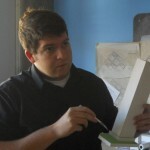 Some teams developed themes for their proposals like “City Ribbon” and the “Under Story”. One team focused on the views afforded by lidding the freeway, and someone quipped it could be named “Fireworks Park”. Common elements between a few of the teams included a north-south Burke-Gilman-type trail along the length of Interstate 5, an outdoor amphitheater next to the historic Paramount Theater, and the inclusion of a school to meet the need for Downtown’s growing family population. All event participants, especially those who couldn’t stay long, were also invited to write comments in response to prompt questions, such as what their favorite Seattle parks are and what other physical improvements are needed near the freeway. There was interest in maintaining Freeway Park as it is, for example, but perhaps with improvements like bringing in food services or even extending the park to block out the freeway noise. Though most people were interested in using lids as park space, there was a strong interest in building more housing in the area. And when asked about prioritization, there was a nearly universal response favoring the vicinity of Pike Street, Pine Street, Olive Way, and Denny Way. The event saw a few visitors from the political sphere. Former City Councilmember Tom Rasmussen stopped by and said he was excited that freeway lids are gaining community support, and Congressional hopeful Donovan Rivers was excited by the amount of work that was happening. Also in attendance were former Seattle mayor Norm Rice and representatives from the offices of Councilmembers Sally Bagshaw and Rob Johnson. Media coverage and more high quality photos were provided by Capitol Hill Seattle Blog and Capitol Hill Times. The end result of the event will be a report featuring each team’s vision. The report will be forwarded to the Seattle Design Commission for consideration during their review of the expansion of the Washington State Convention Center (WSCC), which will be directly adjacent to I-5, and the project’s required public benefit package in exchange for five street vacations. 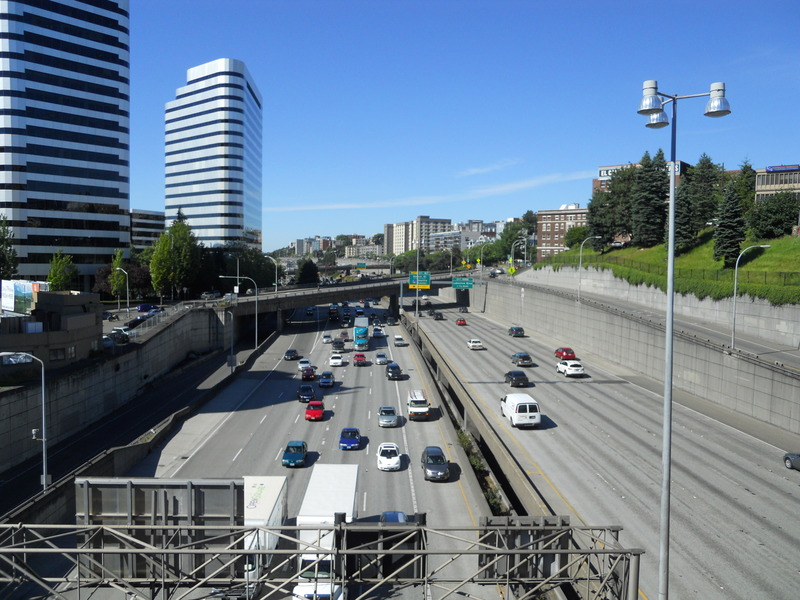 By showing broad community support for lidding the freeway, the Lid I-5 campaign aims to get a lid feasibility and engineering study in the benefits package. The actual timeline for lids remains to be determined, but as Seattle continues to grow at a blistering pace the campaign believes now is the time to plan for lidding the freeway as dozens of other cities have already done. Seattle’s Center City has a current park space deficit of ten acres, and if nothing changes that will grow to 40 acres by 2035 with expected growth in housing and employment. And lids have the potential to increase space for parks and other uses at a cost up to the half the price of Downtown land and without reducing the tax base. Lidding I-5 is a big idea that needs big support, and the public campaign is just beginning. If you are interested in being involved, sign up for the Lid I-5 mailing list and keep an eye for event opportunities in the near future. Scott Bonjukian is a volunteer with the Lid I-5 campaign. Any cost estimates on how much per SF to design, construct, and decorate such a lid? I didn’t think so…. Yes! Average costs for park lids around the country are in the ballpark of $500 per square foot. You have a link for that cost point? I’d imagine trying to lid multiple blocks has a much higher cost per square foot than simply lidding a single interchange, as a larger lid runs into ventilation and emergency access issues that a short lid (or a bridge) does not. Lidding that entire section of I5 effectively turns it into a tunnel, with all the associated cost & complications of building & maintaining a tunnel. Good stuff! While it clearly makes sense around Pike/Pine and Denny, I’m most interested in a lid north of Denny, because there’s such a huge span with no crossing of I5 at all. A direct connection between Seattle’s hottest residential neighborhood and the fastest growing employment area seems like a no-brainer. However, the grade is pretty extreme. Are there any good ideas right now on how to address that? It isn’t too hard around Pike/Pine, where I-5 is in a trench, and the hill is steep but not crazy. Getting from above I-5 down to Eastlake between Denny and Mercer, though, seems like a big challenge. A challenge well worth the effort; a heck of a lot of commutes could shift to walking with that shortcut, to say nothing of the added park space, improved transit access, etc. Totally agree! And what we’ve seen from other case studies is that where the freeway runs in a trench simply makes the most topographical sense. Wouldn’t it be much cheaper to just build a few pedestrian bridges to connect the neighborhoods, rather than lidding it? That would achieve the goal of connecting the neighborhoods at a cost $100s of millions cheaper. Lidding also brings extra risks, making it harder to get to people in an emergency on the interstate, and much more difficult to do repairs on the roadway.